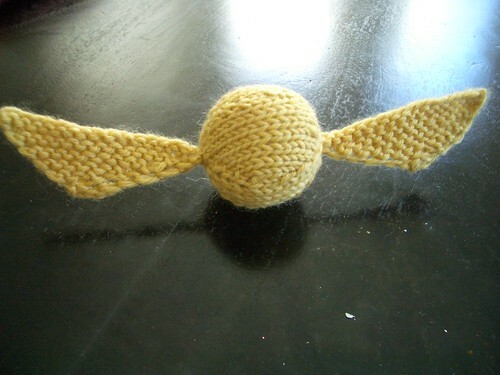 I made this pattern for the Golden Snitch up a few movies ago for a store window but realized I had never shared it you all until someone asked for it recently on Flickr..
Now this snitch won’t be flying off anywhere soon but it looks cute hanging by some fishing wire from a ceiling or lamp. Wire to make the wings stick out. Gauge is not important on this project just get a tight stitch to hold the stuffing in. Cast on 6 stitches & divide them evenly among three double pointed needles. Join together being careful not to twist & place a stitch marker between the last & first stitch. Stuff the ball at this point shaping into a round ball. Cut your working yarn leaving about a 6-inch tail. Put the tail on a needle & thread it through your 6 remaining stitches. Pull tight to close the ball. Sew the wings on the cast on & bind off ends of the ball as in the picture above. Thread a thin piece of wire through the top of the wings & through the ball. Secure it by folding over a little bit of the wire around a stitch & pinch tight with pliers. That is fantastic! I'd love to link to this if you don't mind. 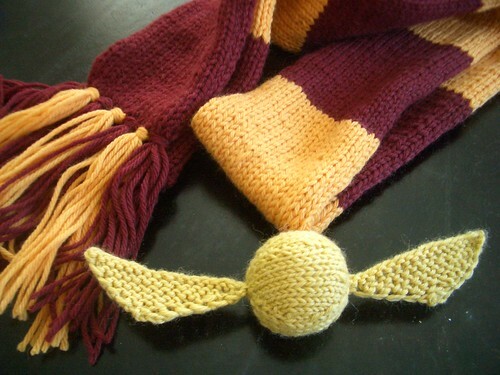 I know a bunch of HP fans that would love this! i am a very knew knitter–what does fb mean in this pattern? knit front and back- you increase one stitch. I would recommend looking at a video online to see how it’s done. knit a stitch normally, but instead of sliding the stitch off your left needle, leave it there and knit the back part of the loop. Wow! That is so cool! But knitting confuses me. I can only make scarves and place mats. I run ukhandknitting.com on behalf of the UK Hand Knitting Association. 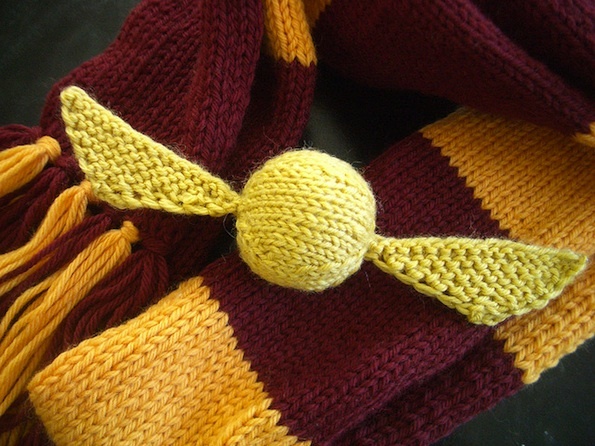 I'd love to feature your pattern on the website as the last Harry Potter film has just been released here. Please visit the website and let me know if you are happy for me to do this. What you did is beautiful! I'm one of the harry potter fans and i'll try to implement your instructions. Thank you for sharing.